It was not me that spent hours combing out my dog’s hair the night before she went to the vet to avoid him seeing her with muddy tangles. It was not me that restocked the fridge just to eat out every night for the whole next week. It was certainly not me that told my husband he could play Xbox360 last night so that I could watch Desperate Housewives undisturbed. However, had I done that, you would think I would have remembered that the Oscars were on, instead of subjecting myself to machine guns for no reason! It was not me that was nearly late for bible study today because of insisting on stopping by the coffee shop, even though the car also had to be refueled to the point of the little red light being on. I did not leave my book and bible on the coffee table this morning when I left. I did not skip an entire week of blogging. I’m not currently postponing studying for a mid-term in order to post this. I’m a very responsible student. I do not have a messy, messy house right now. Not me. I am not going to bed before 10:30 10:00 tonight. 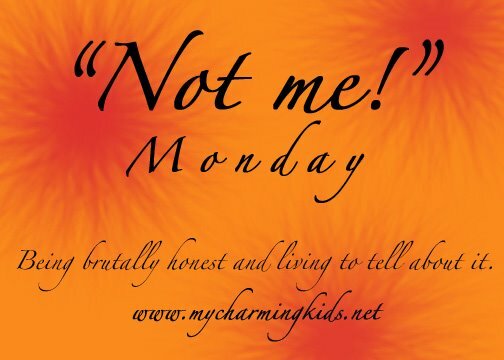 Just found your blog through MckMama/Not Me Monday! I used to postpone studying just to blog too!Great not me! Happy Monday!